I really wasn't planning to make pickles. I know pickling is hot right now, but it just wasn't something that interested me all that much. 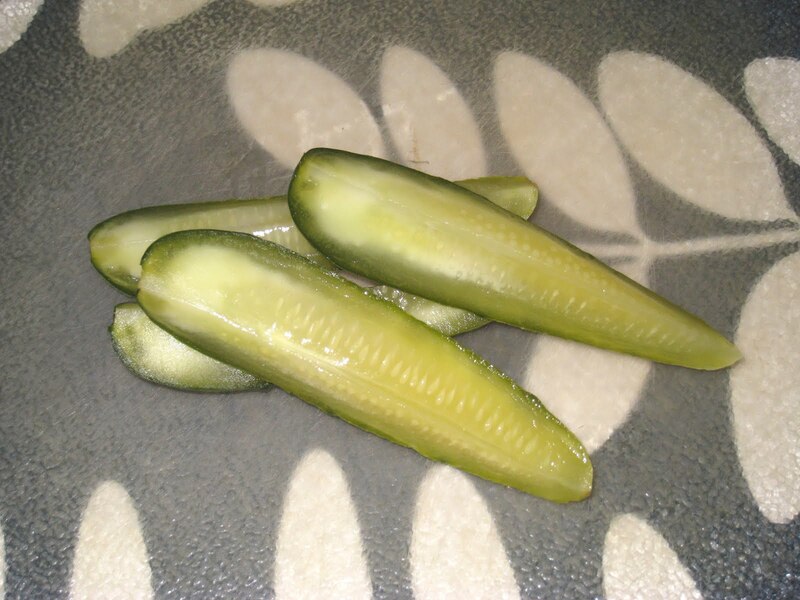 I like pickles well enough, although I am rather particular in my tastes; there are only one or two brands out there that I will eat. They have to be crisp, and not too sour. So making them wasn't even remotely on my radar. 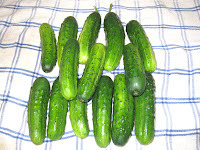 Until I saw the beautiful batch of pickle cucumbers Iron Creek Farm was selling at the Green Market. They were so firm, so green, and so well, pickle-like that I decided right then and there that it was time for me to make some pickles. They also happened to have seeded dill at another stand that day so I grabbed that as well. I looked through various recipes, not even knowing enough about them to know what recipe to use. But the recipe in the Second Avenue Deli Cookbook looked easy to follow and did not require a lot of equipment. 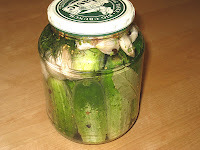 I knew I was not ready to try anything that required sterilization or water baths, and this recipe just calls for you to put the cucumbers in a jar with some brine, garlic, and spices and let it sit for a few days. And here is the jar just moments after I filled it. It is actually more involved than just filling up the jar with the cucumbers and brine. First, you have to cook the brine. You bring the water and salt to a boil and then let it cool down to room temperature before you use it. Because the brine is not hot, the cucumbers don't cook, so they stay fresh and crispy. Just the way I like them. Here is the first volunteer from the jar, three days later. I wasn't sure it was going to work, but lo and behold the brine permeated through the cucumber and I had me some bona fide garlic dill pickles. The first batch I made I used too many of the spices, but after some minor adjustments I had the combination that I liked. Although ready-made pickling spices would work just as well. The garlic cloves get pickled too, and I've been using them where I would use raw garlic or I'm cooking something that benefits from an extra bit of acid. They were not blanched, though, so be warned that they are raw cloves of garlic and as strong, if not stronger, than regular raw cloves so you do not want to be eating them right out of the jar. Just saying. These pickles were such a success that I naturally found myself looking for other things to pickle. After a batch or two of refrigerator pickling projects, I'm about a heartbeat away from full-on canning. If you have been curious about the pickling process and want to try your hand at it, this is a good way to start. The only special equipment you need is a jar that is big enough to hold the pickles. 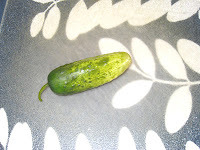 Clean the cucumbers under running water, being sure to scrub them clean. Combine the water and salt in a large pot and bring to a boil. Turn off the heat and allow the mixture to come to room temperature. Wrap the garlic cloves in a towel and lightly crush them with the back of a knife. Pack the cucumbers tightly into a wide-mouthed jar and then add the rest of the ingredients, then pour the brine over them. Close the jar and shake it to evenly distribute the spices. Store the jar in a cool unrefrigerated place for 4 to 6 days, depending on how sour you want them. The longer they stay out, the more sour they will be. Open the jar once a day to skim off any foam. Pickles will last in the refrigerator for a few weeks.